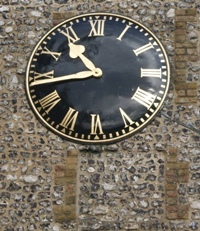 The two dials and pairs of hands of the church clock were removed on 23rd October 2012 and taken to the clockmakers' workshop for repainting and guilding. The refurbished dials were re-installed on 20th and 21st November 2012. These two articles tell the history of the clock, and how it came to be acquired by St. Giles. The clock was made by Barraud & Lunds of Cornhill London. This firm first traded under this name in 1864, and continued to do so until it ceased trading in 1926. Name plates on their clocks usually give both the street name and number, e.g. in 1864, 41 Cornhill, in 1884, 49 Cornhill, and in 1893 the address is just Bishopsgate, perhaps while the Cornhill site was being rebuilt. The only clock plate inscribed as ours, that I have been able to trace belongs to a much smaller domestic clock and that was known to have been made in 1885. This would appear to be a suitable date for our clock, taking into account its construction and the materials used. I think we should settle for the last quarter of the 19th Century as the date of our clock. The clock frame is built up from steel sections and does not appear to contain any cast iron at all, something I should have expected if it had been made at the end of the 19th. or at the start of the 20th. century. The mechanism is driven by weights attached to wire ropes, which pass over pulleys to the winding drums inside the clock frame. The weights have a fall of about 6m (20ft), partially in the bell chamber and partially in the west wall below. The bottom of the weight pit, which is filled with gravel to break the fall of the weights if they drop down suddenly, is behind the small oak door in the west wall of the landing which leads to the gallery. As the ropes from the weights pass over a triple pulley system to the winding drums the actual rope movement is some 18m (60ft), which requires about 45 turns of the winding drum each week to raise the weight to the top of their shaft. The clock has two similar winding drums, one supplying power to the going train (this moves the hands and triggers off the striking) and the other to the striking train which strikes the hours on a bell high up in the tower, hanging from the steel joist which spans the tower.. The going of the clock is controlled by a pendulum, the rod of which is made of wood and is some 170cm in length. This rod carries the lead bob which is 25cm high and 15cm in diameter. These proportions give quite good compensation for temperature changes. The pendulum has a total length of just under 2m (6ft) and weight of about 50kg (ll0 lbs). This gives a period of swing of 2.5 seconds which is slower than that found in most church tower clocks. The rating nut at the bottom of the pendulum rod alters the going of the clock by one minute a day for each complete turn of the nut. The escapement is of-the Graham Dead Beat type, and not the Anchor type usually found, and a power maintaining system is fitted to ensure that the clock keeps going even during winding. The striking control is of the rack type which cannot get out of step with the going train. The drive to the two clock faces, which are on different levels on the North & South walls of the tower, is by rods and bevel gears. The drive from the 'clock’ to the faces rotates once an hour and reduction gears are situated behind each face to drive the hour hands, the minute hands being driven directly. The firm of Barraud and Lunds are better known as makers of Chronometers, but did make many tower clocks. Paul Barraud lived and died in Orpington, in the 1860’s. Late in 1949 when the tower of the church was burnt out, and the gallery damaged, the PCC looked into the question of renovating it. But it was not (I think) until 1951 that a definite proposal was studied, and it was decided that the four corner pillars should be removed and a Kentish Cap be fitted, with a typical Kentish weather vane. This involved a new staircase, and a door to the vestry. The single bell had to be recast. With the rebuilding and redevelopment of estates getting under way in and around the area, I realised there might be a good stable clock available somewhere. After a long (somewhat secret) search, I thought that the clock in The Rookery, Bromley Common, might be suitable and somehow managed to have a look at it. 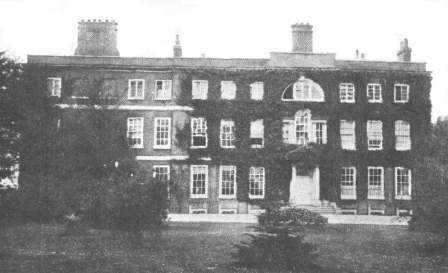 The stables where the clock was, was the only building undamaged on the estate, after occupation by the Army. The PCC agreed I should write to General Norman, the owner, and he generously replied that we could have the clock for the sum of twenty pounds, but stated that in less than (I think) a week the estate would be in the hands of Kent County Council, and the clock would have to be removed before then – so the chase was on. There was a clock maker at the bottom of Masons Hill, opposite the hospital, whose family had cared for the clock all its life at the Rookery, but he was so angry when told of our plans that he would not co-operate. Possibly Messrs Thwaites & Read, got the clock out, but I do remember that we only had one day left when the movement, dials and hands, also the bell , were got out, and I don’t think that we actually got it off the estate, until after Kent County Council. had taken over the site. Thwaites & Read arranged for the installation, which involved building a platform for the clock, two bricked arched windows through the tower walls and a guarded and strengthen chimney for the weights, pulleys and wires. Also a new mechanism from the movement to the clock face had to be installed, the clock was made to strike its bell on the hour. The movement is a well made simple movement anchor escapement, with auxiliary power by weighted arms to keep the clock going whilst that weight was being wound up. The dials were thought to have been too large and we hoped to find more suitable ones, but the church architect agreed to install the ones from the stables, when none could be found. I think that it cost £400 to install, which rather shattered the PCC, but by that time there was no turning back. The clock was originally made by Messrs Barrand & Lund of Corn Hill, London.